Karate has become immensely popular and taught in a genuine manner from a reputable teacher, a student will learn very important life skills that can prevent victimization and bullying behaviour. It is not necessary to teach children about self defence from a knife attack or being mugged etc. The real life dangers that threaten children are more likely to be “peer pressure” and making bad choices. Children need to be taught how to be strong minded, courageous and encouraged to train with intensity in their Karate to learn the moral codes that it teaches, as the lessons that are learnt from people who have the most influence may not always be the right ones, depending on a person’s upbringing. Strong minded children with a correct moral behavioural code to follow, who train regularly under correct instruction will be more likely to stand against peer pressure and because of their training have the physical ability and confidence in their Karate to defend themselves and the decision that they have so rightmindedly made for themselves. Life is about making choices and one has to have the courage to make the right choices. Courage builds with correct Karate training. Along with building courage one must also develop courtesy so that being assertive is always done with the best of intentions and manners possible. Genuine Karate should encourage students of all ages to think about what they are doing and not perform mindless techniques. It takes a patient and conscientious teacher to encourage and explain to students what thinking processes should be alerted and that they should be learning to affect these thinking processes for themselves. This teaches them to be more aware of what they are potentially capable of. This will encourage independent thinking. Once certain foundations have been placed within the psyche, these being the realizations of abilities and identity, a stronger sense of self is developed. This gives a student more certainty in the decisions that they make for themselves. Learning correct thinking processes calms the chaos of the mind. Proper body dynamics have to be applied in Karate techniques so therefore a procession of specific mechanics have to be activated and specifically timed to enable the fluidity, speed and power of movement. These combinations have to be timed so that they are all focused together at the last moment on the impact of a strike. Not only do these dynamics have to be executed in a particular order but also the mindset that will enable the techniques has to also be in order. So the mind has to be trained to be able to acquire the correct thinking processes. When a child, or any student is determined to learn the techniques in all their detail, their mind automatically starts to learn the necessary thought processes. To be able to perform Karate techniques with all the proper dynamics requires clarity, focus, complete awareness, balance, coordination and determination. As the mind becomes more clearly focused and determined the body will be able to achieve greater things. A student then starts to feel a sense of achievement and confidence in their developing and improving abilities. Karate training teaches all students to be more aware and teaches them to put themselves under scrutiny. They have to teach their bodies right from wrong. It would be an absolute miracle if a student came along who was able to perform with complete perfection, so these things have to be learnt. When learning the Karate techniques the body goes through a process of finding the right way to do things and the wrong way to do them. What Karate has then given that student is a tool and the ability to learn the right way and the wrong way. This tool can then be used in other areas of their life. It is not good practice to force any young student to do what you want them to do, but rather teach them how to make sensible decisions and discipline themselves to be motivated. Vulnerability and insecurity stems from self doubt. Doubt only arises from not being sure that one can make the right decision, or doubt and stress because one does not believe that they are strong enough to stand up for themselves and be assertive. Analysing thinking processes under certain conditions allows a student to learn about strategies. I don’t mean strategies to deal with an opponent, but strategies to deal with their own thought processes. strategies that will help them through, maybe even use the exercise as a tool to find a permanent solution to the problem. This is possible through good instruction and a lot of inner reflection. What is learned in the dojo (training room) can then be taken home and used as a tool to improve the quality of life. When students of Karate start to learn about themselves, they start to realize how their behaviour affects those around them and to understand how their personal conduct will ascertain how other people will react to them. Their personal conduct is what they display and how they present themselves to the world, the way they dress and their mannerisms. These things are consciously and subconsciously evaluated by others. So before any actions or words, a person has already been evaluated and categorised by the other person based on the impression given by their conduct. This will decide how that person is treated. It is no good for anybody to say “but I didn’t do anything” and be ignorant and mindless about their own personal conduct. Students need to be taught to ask themselves the questions” how do I treat myself?” if they do not treat themselves with respect, they will not behave respectfully. If they are not behaving respectfully, others will not be respectful of them. When students learn to become mindful in their training, the mind will begin to process connections that connect them to their psyche (self, soul) then they can begin to learn and develop an understanding of their own nature, how they fit into the world and how their behaviour affects others. Everyone has uncertainties. The more certain that students become with their own identity (self), the more their decisions will start to have weight, substance behind them. The more weight and substance that decisions have the more likely they are to defend them as they will feel on solid ground in their convictions. An animal will not fight another if it does not think that it has a chance of winning or if it thinks it could get wounded. We are animals and our subconscious instincts are quiet similar. Believe me you don’t want to fight with someone who believes that they are on solid ground with their convictions as they will fight to the death. This in itself can give protection. Being impressionable is linked from insecurities, wanting to be liked and accepted makes one vulnerable. Learning Karate from a knowledgeable source teaches the most important lessons, one of them being that the only acceptance ever really needed is your own. Karate has a strong underlying spiritual developmental aspect. As the mind becomes more knowing and stronger Karate instils within the psyche its correct moral code of conduct. These assets develop from the inside to the outside and teaches the student about the true nature of the self leading on to a strong mind and the ability to make correct decisions with certainty and conviction. Everyone should be very aware that peer pressure is the real life danger and threat to youngsters and any vulnerable or impressionable person. Children often make mistakes with their lives due to peer pressure, which affects the future quality or direction of their life in a negative way. All because they didn’t have the courage to stand against it or they didn’t know any better or were unable to perceive the consequences. We have a collective responsibility to all of them to try and eliminate this problem. Adults should have strategies and mechanisms in place that prevent them from doing certain things. Children do not have these simply because their minds haven’t learnt them as they do not have the knowledge or experience, so they can present a danger to themselves and those other impressionable children, people around them. Also a predatory adult will prey on youngsters and vulnerable people who are easily impressed. Children have got to learn to have the courage to make the right choices. A Childs moral compass does not register the correct direction so they seek approval to understand right and wrong. If they are getting positive stimulus from what they are doing then it must be right. If they get negative reactions from what they do then it must be wrong. So it is the parent’s duty to set the parameters and to make sure that the people and teachers in a position to influence their Childs life has integrity and that Childs best interest at heart. Children are small people and it is a mistake to think that they cannot develop strategies to improve and lift the quality of their lives. When they are being trained in Karate, they should be presented with analogies that they easily relate to and language should be a little more simplistic but the essence and content of the lesson must be the same as the adult. 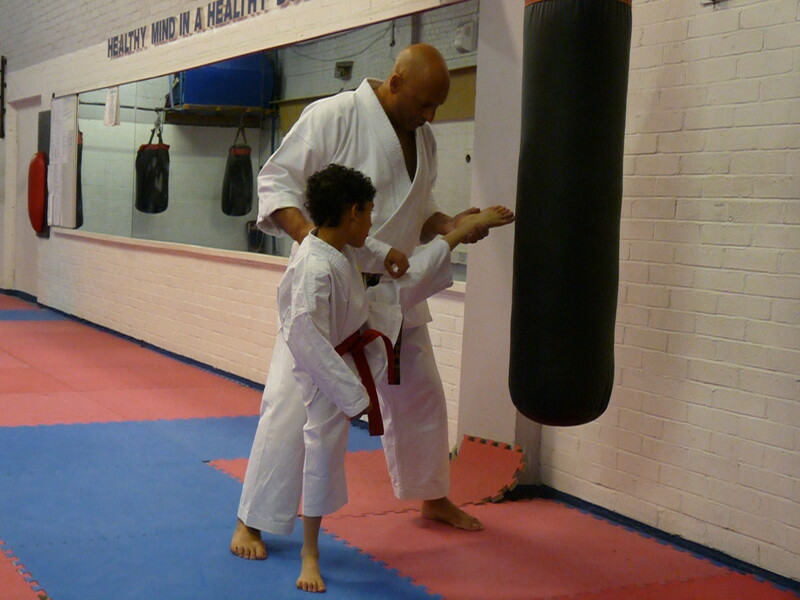 Through Karate students learn how to control their bodies and you do exercises that face them with certain conditions. They learn how to control those conditions and as the intensity of the exercise increases with experience and advancement they are confronted with fears which they learn to control and its understanding about fear and its effects which allow them to transcend those effects or channel them positively. Students should learn how to turn a negative effect into a positive effect which gives them the tools to step above peer pressure and bad personal judgement. This is why students have to be trained the way they need to be trained and not the way that they want to be trained. This is why there needs to be no compromises, no short cuts and no easy answers. It’s also why when it gets to the point where there’s pressure within the class it becomes the easy option to pack up. It’s down to instructors and parents to encourage and coax the children through those times with a little bit of cajoling and a little bit of gentle force. Sometimes children need to have a lot of guidance and encouragement even to be made to do things that they don’t enjoy because to give into it is a loss and a detriment to building their psyche. Karate is about physical and mental conditioning. Although sometimes training can be too severe, from uneducated instructors with no rhyme or reason to what they teach, this can be detrimental? If it’s not good for the body then it certainly is not good for the mind. 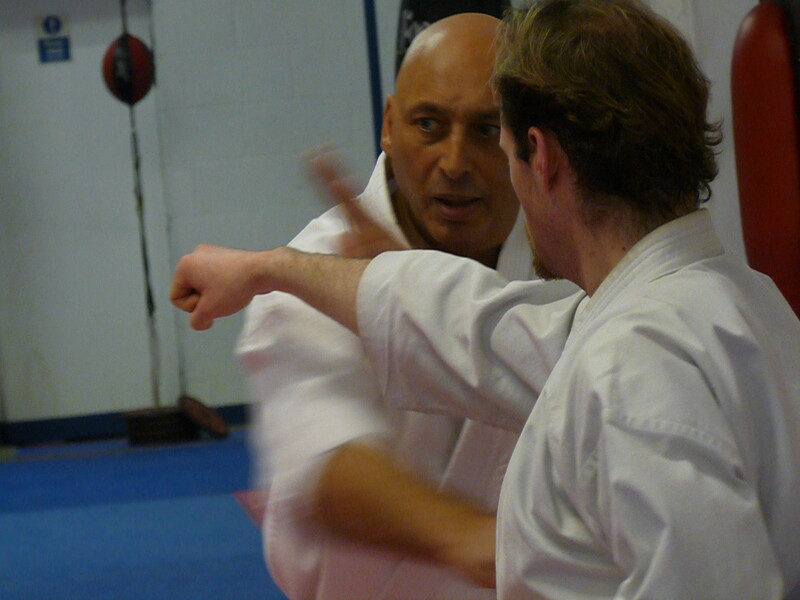 How Karate will affect a student will largely depend on the motives of the instructor. Instructors teach for many different reasons? Some are genuine and work with the interest of the student in mind. There are many who are only interested in their own agenda or making huge profits. This indeed will affect the progressing attitude of the student in a detrimental way. Dress code is important within a class. Just a plain white uniform will make everything fundamentally equal. There should be nothing flash or ostentatious. Uniforms are expected to be clean and ironed, belts should be tied correctly and of the appropriate length. This ensures everyone is balanced and equal. Someone from a poorer background can stand next to someone from a more affluent background and the only thing that will distinguish them is the standard of their Karate and the colour of their belt. The development of their attitude and spirit is paramount to the underpinning of the physical training as a child that does not develop their inner attitude (strength) will struggle to achieve what’s required of them physically. Children should be taught to be strong minded in a positive way that can then be backed up with strong conscientious physical ability. This correct self protection starts with correct attitude and manners. There are clubs whose students wear miscellaneous T-shirts and bottoms with a belt tied around their waist, which is fairly meaningless as the belt is to keep your suit wrapped around your body and to keep up trousers. Flashy types of uniforms can make students feel better about themselves but for the wrong reasons, so all these are misguided values. This can also ascertain to an element of peer pressure. Society as a whole needs to be lifted out of this negative peer pressure trap as it does not only effect children but it also affects adults. It doesn’t matter how old a person is, they can still learn about their own mind in a way that will give them enough self assurity to not allow themselves to be affected by peer pressure. Peer pressure seems to have been swept under a rug of ignorance and classed as a young person’s problem. The peer pressure problem affects all children and all adults at varying times. Most adults are in a position to make up their own minds whether or not they want to change the way they think but children need to be guided towards a method that is going to teach them those important life skills like learning how to properly behave and conduct themselves in such a way that is not going to attract negative attention. Learning this correct code of conduct is what will keep children safe from harm and stop them from harming others as they will learn about dignity and self respect on deeper levels where they need it. These codes of behaviour can be learned through training but only if students are willing to try hard and embrace the mental challenges presented to them.